The Winter 2016 Edition of the Duquesne University Magazine featured two articles highlighting notable accomplishments related to the School of Pharmacy. 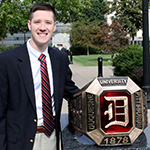 Gregory Caspero, a current PYIII student, helped bring to life a new fixture on campus. 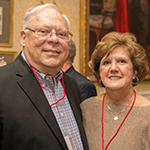 The Duquesne University "Century Club" recently inducted School of Pharmacy distinguished alumni Gilbert and Joan Zilner.